Monarchs Pratt to Hockey East Bound- University of Connecticut! Another Jr. Monarch to Hockey East...Feeley chooses U.V.M. Jr. 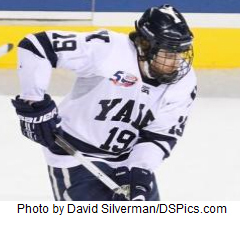 Monarchs Alum Trent Ruffalo wins NCAA National Title with Yale!!! 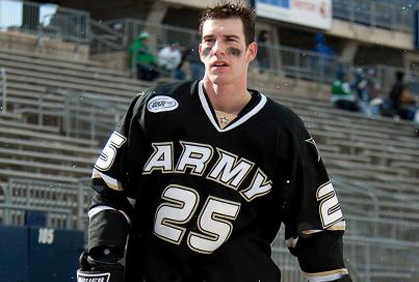 Army defenseman Rocha ‘humbled and honored’ with Senior CLASS Award. Former New Hampshire Junior Monarch Pat Galbraith, a native of Denmark, is currently playing for HC Slovan out of Bratislava, Slovakia. Yesterday, he was called upon to start for the NHL Premiere Challenge against the New York Rangers; holding the NHL club to only four goals. The game recap can be found here. 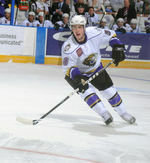 Galbraith played for the Monarchs during the 2006-2007 season. ALBANY, N.Y. - The 2011-12 ECAC Hockey Preseason Coaches' and Media Polls were announced Wednesday morning prior to the league's annual teleconference. Dartmouth was selected fourth in the media poll and fifth in the coaches' poll, while senior goaltender James Mello (Rehoboth, Mass.) was named to both preseason all-conference teams. "I really feel like we have a great year ahead of us," head coach Bob Gaudet said. "This is a great league and I feel good about where this group is right now. We have nine new guys coming in that need to assimilate, but there is also a good mix of veteran leadership that will make this team a tough one to play every night." In a vote of the conference's 12 head coaches, the Big Green earned the No. 5 position. Yale garnered nine first-place votes to earn the top spot, while Union received two first-place votes and finished second. Cornell and RPI were third and fourth, respectively, as the other two teams selected ahead of Dartmouth. The Big Green were followed by Quinnipiac, who also earned one first-place vote in the process. Harvard, Princeton, St. Lawrence, Colgate, Clarkson and Brown round out the coaches' poll. The media poll was slightly different as Dartmouth moved up one spot to fourth with one first-place vote. The top three spots of Yale, Union and Cornell remain the same from the coaches' poll before Dartmouth and RPI switched places. Quinnipiac follows the Engineers in sixth place with Princeton earning the seventh spot. St. Lawrence, Clarkson, Colgate, Brown and Harvard occupy the eighth through 12th places in the bottom half of the media's poll. Mello, who was one of the top goaltenders in ECAC Hockey last season was recognized by both the coaches and the media with a spot on both preseason all-conference teams. Last season, Mello posted a goals-against average of 2.21 and a .926 save percentage with a record of 17-9-3. With a league-record 38 members of the media participating in the poll this year, Mello received 28 votes as the league's top goaltender. 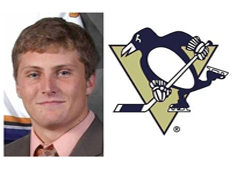 St. Paul, MN- The New Hampshire Monarchs and the Eastern Junior Hockey League congratulates alumni Paul Thompson and Brian Dumoulin, both formerly of the New Hampshire Jr. Monarchs, for being among those selected to the Reebok All-American Teams, as selected by the American Hockey Coaches Association. Thompson, a Hobey Baker finalist from University of New Hampshire, adds this award to an already-lengthy list of honors achieved this past season. He also has the Hockey East Player of the Year, First-Team All-Star, Three Stars Award, and Scoring Champion to show for his spectacular senior year. He was also recently named New England Player of the Year. While with the Monarchs, he set the single-season scoring record in 2007 with 83 points, led the Monarchs to the 2007 EJHL Dineen Cup Championship, and was named the league’s Most Valuable Player. Thompson recently signed a two-year contract with the Pittsburgh Penguins. Dumoulin, a sophomore at Boston College, played for the Monarchs during the 2008-09 season and was named the EJHL’s Defensive Player of the Year. As a freshman, he and his Boston College teammates won the NCAA championship. This past season, he was named to the All-Hockey East First Team and won the league’s Best Defensive Defenseman award. He also played for Team USA in the IIHF World Junior Championships, winning the bronze medal. Congratulations to Paul Thompson and Brian Dumoulin. The entire Monarchs Family is so very proud of both of you!!! 2007 must have been a great vintage!!! Kearney is 6th Monarchs to Sign Pro contract in 1 month. SPRINGFIELD, Mass. -- On day after signing with the Springfield Falcons, Yale forward Denny Kearney enjoyed a memorable professional debut, assisting on the game-winning goal in the Falcons' 3-2 come-from-behind victory over Bridgeport Friday in American Hockey League (AHL) action at the DCU Arena. Donning jersey No. 33, Kearney finished with one assist and was plus-1 for the game. He signed an Amateur Tryout Agreement (ATO) Thursday with the Falcons. 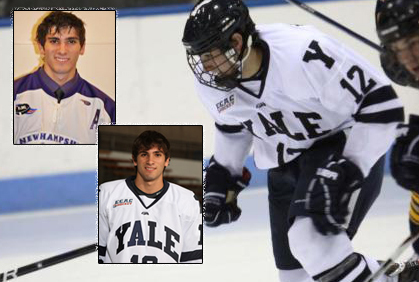 Kearney recently finished his collegiate career with Yale where he registered 45 goals and 86 assists for 131 points in 138 games. Kearney improved his point production all four years at Yale and collected a career high 16 goals and 41 points in 36 games this past season. Pittsburgh, PA- The Pittsburgh Penguins agreed to terms with New Hampshire Jr. Monarchs alum Paul Thompson, signing him to a two-year entry level contract, the team announced today. Thompson attended the Penguins’ development camp in 2010 and just completed his senior season at New Hampshire. He was awarded the Hockey East Player of the Year Award after posting 52 points this past season and is a finalist for the 2011 Hobey Baker Award. 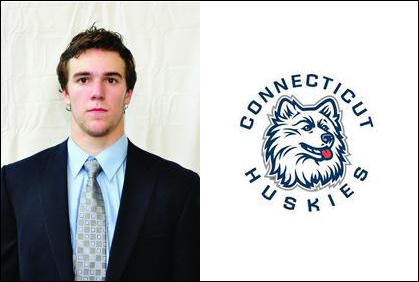 Prior to enrolling at UNH, the Derry, NH, native played for the New Hampshire Jr. 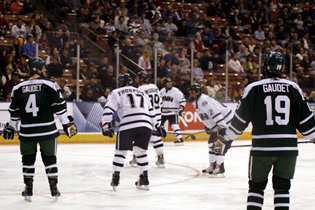 Monarchs from 2005-2007, where he played an integral role in the team’s back-to-back Dineen Cup Championships. He was named the 2007 EJHL Most Valuable Player and his 83 points in the 2006-07 season still holds as the EJHL single-season scoring record. Thompson will report to the Penguins’ AHL affiliate in Wilkes-Barre on Wednesday. Mello named Finalist for league's Player-of-the-Year Award. ( NH Jr. 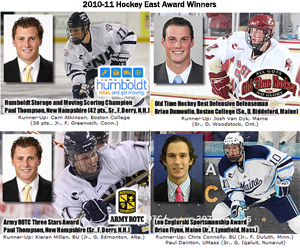 Monarchs) has been selected by the ECAC Hockey coaches as one of three finalists for the 2010-11 Ken Dryden Award. The league honored the former Cornell goaltending great beginning in the 2001-02 season, by tagging his name with the annual Goaltender of the Year Award. Mello joins Keith Kinkaid from Union, and Rensselaer’s Allen York as finalists. Boston, MA- The Gridiron Club of Greater Boston announced Monday the 16 players who are semifinalists for the Joe Concanncon Award, presented annually to the best American-born Division III college hockey player in New England. Among the recognized players are former Eastern Junior Hockey League alumni Jeff Fanning (Bowdoin College/ New Hampshire Jr. 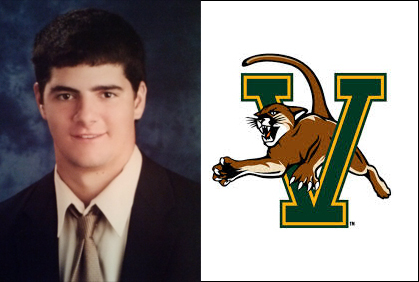 Monarchs), Josh Harris (Castleton State/ Bay State Breakers), and Wes Vesprini (Trinity College/ Junior Bruins). Fanning played for the Monarchs during their 2007 EJHL Championship season and scored 10 goals and 8 assists in 35 games. The senior is currently Bowdoin College’s third-leading scorer with 18 goals and 6 assists. Sophomore defenseman Brian Dumoulin had three assists for the Eagles. Congrats to Paul Thompson - 100 Points!!! Flynn scored three goals and added a pair of assists in Maine's two victories on the weekend. He scored two goals, including the overtime game-winner, in Maine's 4-3 win over Providence on Friday night and added had an assist to finish the game with three points. Flynn tallied a goal and an assist in Maine's 4-1 win over No. 3 Boston College on Sunday night, finishing the weekend a +4 rating. When the polls opened recently for fan balloting for college hockey’s prestigious Hobey Baker award, three former Monarchs were recognized. Senior Forward Paul Thompson at the University of New Hampshire, Senior Forward Denny Kearney at Yale University, and Senior Forward Ian O’Connor at Providence College. All three are on pace to nearly double their previous collegiate statistic highs. Kearney has been an instrumental member of the currently ranked number one Yale squad, while Thompson is an equally important piece of the puzzle at number four UNH. O’Connor has been a crucial stalwart both on the ice and off, room as he captains Providence, currently 7th in the Hockey East standings. All three were key members to the New Hampshire Junior Monarchs Championship teams of 2006 and 2007. COLOGNE - Denmark goaltender Patrick Galbraith (New Hampshire Jr. Monarchs) looked down the ice and saw teammate Stefan Lassen charging the USA net and thought maybe his teammate shouldn't be doing what he was doing. But Galbraith was all smiles seconds later when Lassen batted a rebound of his own shot past Team USA goalie Scott Clemmensen at 2:04 of overtime to left Denmark to a 2-1 triumph over the United States at the World Championship on Monday. "I was just thinking what is he doing up there," said Galbraith. "Then I said that is a good play, a heads-up play." Lassen was in full stride when he snapped a wrist shot that hit goaltender Scott Clemmensen in the chest. Lassen kept going and he got his stick on the puck to score the winning goal. "I saw the defenceman hestitate and went for it," said Lassen. "It felt unreal to see it go in." The win allowed Denmark to continue its march to the qualification round of the 16-team tournament. Denmark has won both its games in Group D and now has five points. The Team USA has collected two points from losing twice in overtime and now has a crucial game on Wednesday against Finland that has implications of which team goes on and which teams heads to the relegation round. "Inexcusable, the U.S. should not be losing these games," said Team USA captain Jack Johnson after the shocking loss to the Danes. "It's inexcusable. At the same time, it's hard to win games when you score just two goals in two games." "We have a huge game against Finland. We have to start winning games or we'll find ourselves going home a lot earlier that we should. I'm very disappointed. We have to figure out a way to win a hockey game." The loss marked the first time since 2003 that the USA has lost its first two games at the world tournament. After a scoreless first period, Denmark's Lars Eller and Keith Yandle of Team USA traded goals in the second period to send the teams to dressing room for the break tied 1-1. Clemmensen and Galbraith took turns keeping their team in the game in the first and second periods respectively. The Danes had an 11-8 shots advantage in the first period and Clemmensen was the main reason why the game was goalless at the first intermission. Clemmensen's first test came at 6:15 of the first when he was quick to get his right pad on a low shot by Frans Nielsen. Midway through the period, the Danes were on a power play when the Team USA goalie stopped a low point shot by Jesper Damgaard and was then quick to smother the rebound. Clemmensen made a third sparkling save with 2:35 to go in the period when he snagged a shot by Eller. Team USA regrouped in the break and carried the play in the second period, but sound work by Galbraith prevented his opponents from running up the score. David Moss ripped a slot shot from the left faceoff circle at 1:27 that Galbraith alertly snagged with his trapper. Team USA was on a power play less than a minute later when Galbraith made three quick saves on a scramble at the lip of the crease at the 2:21 mark. Not long after, he smothered a rebound before a USA forward was able to pounce on the puck. T.J. Galiardi accidentally lifted the puck into the stands on a clearing attempt and was sent off on a delaying the game penalty at 7:32 and Denmark scored on the power play to take a 1-0 lead at 8:52. Eller stepped into a slap shot that sailed over Clemmensen's shoulder after the goalie dropped to his knees. Yandle tied the game on a power play, with Peter Regin looking on from the penalty box where he was serving a tripping penalty. T.J. Oshie was to Galbraith's right and the USA forward was behind the goal line when he spotted Yandle pinching in from the point. Oshie sent a crisp pass to his teammate and Yandle snapped the puck past a diving Galbraith to tie the game 1-1 at 12:03. The U.S. went into the game with a 2-1 won-lost record against Denmark. -Written by Alan Adams, courtesy of International Ice Hockey Federation. Army's coach said that on a team with no senior defensemen and only one junior defenseman Cheyne was a solid leader on the ice. Army's coach highlighted Cheyne's major role in all 36 games, his work ethic, his poise with the puck and leading the team with 59 blocked shots. Brian Dumoulin - National Champion!!! It would seem that championships and individual success are becoming the norm for Boston College freshman and former Monarch defenseman Brian Dumoulin. This past Saturday Dumoulin and his Boston College teammates captured the NCAA Men’s Ice Hockey National Championship, defeating the Wisconsin University Badgers by a score of 5-0. Dumoulin was named to the NCAA Frozen Four All-Tournament team, recording an outstanding +10 in BC’s four games and notching 3 assists. The NCAA Championship is the high point in a 4-year run of championships for Brian. He was a member of back-to-back Maine state champion teams while starring at Biddeford High School, and last year while playing with the Monarchs, he helped the team earn their 4th straight EJHL Regular Season crown, and their 3rd straight National Title. The 2nd round draft pick of the Carolina Hurricanes has been a key factor in all 4 of those championships. Dumoulin earned Player of the Year honors in Maine his junior year, and led the state in scoring as a defenseman. That following summer he was selected to the US National Under 18 team that competed overseas in the Ivan Hlinka Tournament in Slovakia. Dumoulin made an immediate impact with the Monarchs. His size and tremendous skill were a major factor in the 2008-2009 team’s overall success, and it also earned him Defensive Player of the Year honors in the league. In June, the Carolina Hurricanes selected Dumoulin 51st overall in the NHL Entry Draft, capping off a season of incredible accomplishments for the young defenseman. This past fall Brian arrived on the campus of Boston College as a true freshman. Just two years earlier he had been a sophomore at a public high school in Maine. Brian was the first native Mainer to ever be recruited to play hockey at BC. Just as he had adjusted his game to better fit the junior level, Brian quickly adapted to the pace of play at the collegiate level, and similar to what he did as a Monarch, Brian then began to excel. He finished the season with an astonishing +40 rating, was a previously mentioned +10 in 4 NCAA Tournament games, and was a +3 in 8 of the 42 games he played. With stats like that it’s no wonder Brian was named to the Hockey East All-Rookie team, College Hockey News All –Rookie team, and was also a runner up for Hockey East Rookie of the Year. The Beanpot Final on February 8thagainst archrival Boston University, a game in which the Eagles won, was the last game Dumoulin had a minus rating. He went the final 16 games of the Eagles’ season playing even or better. So in his first season as a Boston College Eagle, Brian added a few more of things to his list of career highlights. Dumoulin and his Boston College teammates claimed the Beanpot Championship, Hockey East Tournament, and the NCAA Frozen Four Championship, and Brian himself earned a spot on his league’s All-Rookie team, a national All-Rookie team, the National Championship’s All-Tournament team, and was runner up for his league’s Rookie of the Year. Not bad for a kid from Biddeford, ME, but it would seem that these sorts of things are what Dumoulin was born to do. BOSTON – Senior forward Bobby Butler (Marlboro, Mass. ), of the University of New Hampshire men’s hockey team, was selected as the Leonard Fowle Most Valuable Player for New England and the Herb Gallagher Award given to the Best Forward in New England. 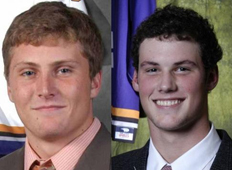 In addition, Butler, Brian Foster (Pembroke, N.H.) and Blake Kessel (Verona, Wis.) were all named 2009-10 New England Men’s Division I All-Stars. The announcements were made on Friday (April 2) and will be presented at the New England Hockey Writers annual awards banquet on Tuesday, April 13 at the Prince Restaurant in Saugus, Mass. 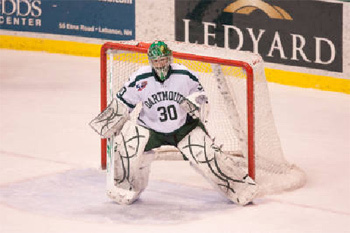 Foster, a 2009 Hockey East Honorable Mention selection, was a 2010 Hockey East All Star First team, a four-time Hockey East Defensive Player of the Week and earned Goalie of the Month in December and January. Hockey East’s ironman in net, Foster played in 38 of 39 games and ranked first in Hockey East in saves (1,128), minutes (2,297:10) and wins (17). In Hockey East play, Foster was in the top five in every netminding category with a 2.75 GAA (5th), .913 save percentage (4th), .653 win percentage (3rd) and 764 saves (2nd). Foster stopped a career-high 50 shots on March 14 against Vermont and allowed two goals or fewer on 16 occasions. Foster’s 1,128 saves in 2009-10 is second behind All-American Mike Ayers (1,139 - 2002-03) on UNH’s single season saves list. DETROIT – Senior forward Bobby Butler (Marlboro, Mass. 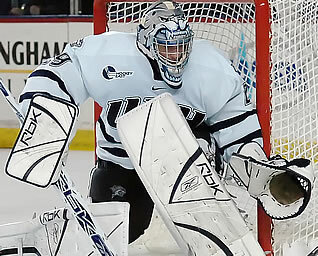 ), senior netminder Brian Foster (Pembroke, N.H.) and sophomore defenseman Blake Kessel (Verona, Wis.) of the University of New Hampshire men’s hockey team, were selected to the Division I RBK All-America team on Friday night as chosen by the American Hockey Coaches Association at the Frozen Four at Ford Field in Detroit. Butler was named a first team All America selection, while Foster and Kessel were both tabbed second team All-America. 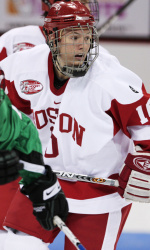 Foster, a 2009 Hockey East Honorable Mention selection, was a New England All-Star, 2010 Hockey East All Star First team, a four-time Hockey East Defensive Player of the Week and earned Goalie of the Month in December and January. Hockey East’s ironman in net, Foster played in 38 of 39 games and ranked first in Hockey East in saves (1,128), minutes (2,297:10) and wins (17). In Hockey East play, Foster was in the top five in every netminding category with a 2.75 GAA (5th), .913 save percentage (4th), .653 win percentage (3rd) and 764 saves (2nd). 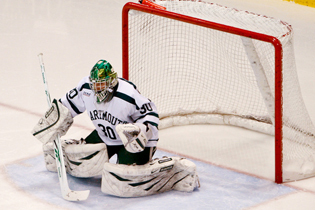 Foster stopped a career-high 50 shots on March 14 against Vermont and allowed two goals or fewer on 16 occasions. Foster’s 1,128 saves in 2009-10 is second behind All-American Mike Ayers (1,139 - 2002-03) on UNH’s single season saves list. ROCHESTER, N.Y. (March 19) - Patrick Knowlton scored with 41 seconds left in regulation to lead Sacred Heart to a 2-1 victory over defending champion Air Force in the second semifinal of the Atlantic Hockey tournament. The Falcons had scored an extra-attacker goal with 1:29 to play to even the score. "Give [Sacred Heart] all the credit for having the guts to come back after we scored," said Air Force coach Frank Serratore. "I'm proud of the way we responded," said Pioneers coach C.J. Marottolo. "It was pretty wild." The teams managed only one goal in the first 58 minutes before the wild finish. Erik Boisvert dove to sweep in a rebound off a shot from Eric Delong at 10:14 of the second period. That goal broke a shutout streak of 161:07 for Air Force goaltender Andrew Volkening at Blue Cross Arena. Volkening had back-to-back shutouts in the semifinals and finals last season. "He's the best player to ever wear the blue and silver," Serratore said of his goaltender. "We let him down by only scoring one goal. Your margin of error is pretty small when you can only score one goal. We died from the disease that has plagued as all season - the inability to score goals. If it wasn't for Andrew Volkening we would have wound up sixth or seventh in the league." With two minutes to play and Sacred Heart leading 1-0, Serratore used his timeout and pulled Volkening. The Falcons won the ensuing faceoff and worked the puck to the Sacred Heart net, where Jacques Lamoureux put in a rebound. "It's ironic that three years ago, we had a wild finish with Sacred Heart," said Serratore. "We pulled our goalie and tied it up and won in overtime. I thought we were going to do it again." With 42 seconds to play, Dave Jarman found Knowlton at the side of the Air Force net, and he was able to roof the pass before Volkening could slide over. "Jarman looked for me," said Knowlton. "He made a pass and it hit off a skate and came right back to him. He looked for me again and made a great pass." 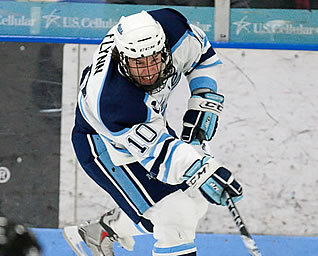 Flynn notched 15 points (10g,5a) in eight games in February for the Black Bears. He had points in seven of Maine’s eight games. Flynn tied a Maine record with five goals and added two assists for a school record seven points in Maine’s 8-4 win over UMass Lowell. Finished the month a +6 plus/minus rating. He averaged 1.88 points per game and 1.25 goals per game in February. Paul Thompson, Joey (#19) and Jimmy Gaudet (#4) go head to head at the Verizon Arena as UNH and Dartmouth compete in their annual trip to Manchester, NH. Junior forward Zach Joy (Dover, N.H.) of the University of Southern Maine men's ice hockey team has been recognized by the ECAC (Eastern College Athletic Conference) Men's East league for his outstanding play during the week of January 11-17. It was announced Monday afternoon by the ECAC office that Joy had been selected as the Player of the Week. This is Joy's second Player of the Week award this season. He previously was picked as the Player of the Week the opening week (November 16- 22) of the season. In three games last week, Joy scored five goals to help the Huskies go 2-0-1. He had two goals in the Huskies' 5-2, non-conference win over Suffolk University, tallies two goals, including the game winner, in a 4-3 win over in- state rival Bowdoin College, and scored the game-tying goal with less than five minutes to play in a 1-1, overtime tie with Colby College. Joy leads the Huskies in scoring with 17 goals and two assists for 19 points. According to the latest national statistics on collegehockeystats.net, Joy is tied for the Division III national lead in goals per game (1.13). 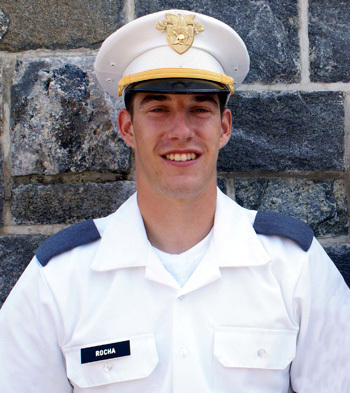 WEST POINT, N.Y. – Cadet Cheyne Rocha, son of Larry and Candace Rocha of Rye, NH completed Cadet Basic Training (CBT) at the U.S. Military Academy and was accepted into the Corps of Cadets on August 15, 2009. Cheyne entered West Point June 30 and has successfully completed seven weeks of CBT. Also referred to as “Beast Barracks,” CBT is one of the most challenging events a cadet will encounter over the course of their four years at the academy. The initial military training program provides cadets with basic skills to instill discipline, pride, cohesion, confidence and a high sense of duty to prepare them for entry into the Corps of Cadets. Areas of summer instruction included first aid, mountaineering, hand grenades, rifle marksmanship and nuclear, biological, and chemical training. Cheyne began classes August 17 at America’s Best College (according to Forbes Magazine). The West Point curriculum offers 45 majors balancing physical sciences and engineering with humanities and social sciences leading to a Bachelor of Science degree. 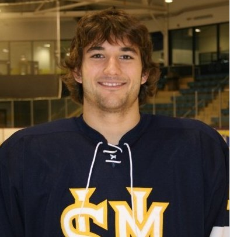 Cheyne graduated from St. Paul’s School in 2008 then played a year of Junior hockey with the NH Jr. Monarch in the EJHL. He plans to graduate from West Point in 2013 and be commissioned as a second lieutenant in the U.S. Army. 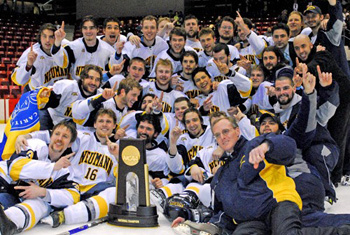 Former Monarchs defensemen, Dominick Dawes, captures NCAA Division III National Championship in first season as Head Coach. In only his first season at the helm, Neumann’s championship makes Knights’ head coach Dominick Dawes only the second person to ever win a Division III title as both a player and a head coach. It was only six years ago he won it as a player as he was a junior at Norwich when the Cadets won the 2003 national championship. The only person to previously have accomplished this feat is current St. Norbert head coach Tim Coghlin. Coghlin was a senior defenseman and captained University of Wisconsin-Stevens Point to its first national title in 1989, and scored the title as coach with St. Norbert just last year. “It’s a great accomplishment and it feels good,” he said of the unique claim to fame. When it comes to winning his title in his first season, Dawes was quick to pass the credit down to those who came before him and built the Knights into a national power in less than a decade. “These guys had the ability when I got here. It was just a matter of coming together and doing it,” he added. With a national championship in his pocket less than eight months into his head coaching career, Dawes has certainly set the bar high for himself and the Neumann program. Keeping the bar at the lofty heights it now sits at will be the next challenge for Dawes—especially considering the Knights will lose 14 players to graduation this spring. “From here it’s going to be finding guys to replace this group,” he said regarding the near future. “It’s going to take some work because there are some pretty good players in this group, but we have to go find some players, replace these guys, and get back here. For now, at least, the “one of the” can be dropped from his comment as the Dawes’ led Knights will forever be in the books as the best team of the 2009 season. 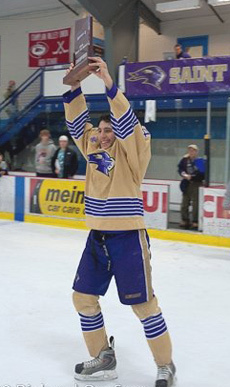 Northeast – 10 Championship Trophy and presents it to a sell out crowd at Cairns Arena in South Burlington, VT. Healey was named to the ALL-Tournament Team as well as the Second Team All Conference. Foster went 6-1-1 in the month with a 1.86 GAA and a .932 save percentage. He allowed two goals or less on six of eight including ending the month with his third shutout of the season, fifth of his career. Foster’s lone loss of the month came as Maine captured a 1-0 win on Feb. 7 on a short-handed one-on-none goal. Foster had 20+ saves in all eight games including a pair of 30+ save performances. Foster ended the month by winning his final five games and was unbeaten in the last six games. He ended the month with 26 saves in a 1-0 shutout win of Merrimack on Feb. 28. MANCHESTER, NH – The Manchester Monarchs, the primary affiliate of the Los Angeles Kings, have re-signed right wing Jon Rheault to a professional tryout agreement, Monarchs Director of Hockey Operations Hubie McDonough announced today. Rheault, 22, appeared in seven games with the Monarchs at the beginning of this season, recording his first professional goal against the Lowell Devils at the Verizon Wireless Arena in Manchester’s 4-3 shootout loss on October 29. He collected one point (1-0=1) and four penalty minutes while playing for the Monarchs. Rheault graduated from Providence College in May following four seasons and 142 games. The 5-foot-11, 200-pound native of Deering, New Hampshire, registered 56 goals and 49 assists for 105 points and 126 penalty minutes with the Friars. 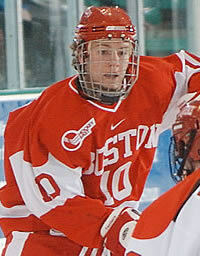 Rheault played with the Manchester Flames and the Junior Monarchs before going to Providence College. 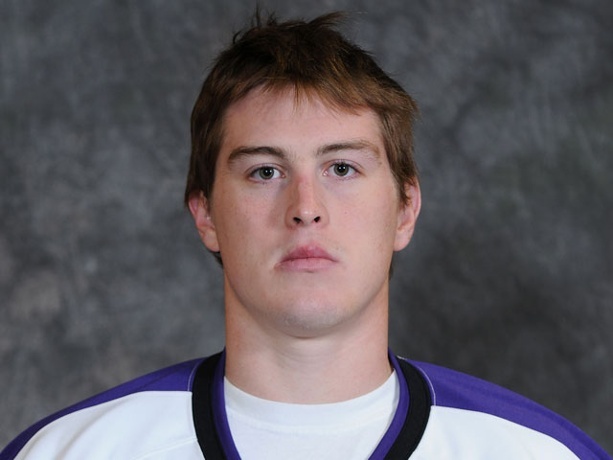 He joined the ECHL’s Ontario Reign in early November when the Monarchs released him from his tryout. While playing for Ontario, Rheault collected 14 points (5-9=14) and 29 penalty minutes in 16 games. Flynn notched the game-winning goal for the Black Bears in the 2-1 win vs. No. 2 BC on Sunday afternoon with 1:34 left in the game. Foster led No. 6 New Hampshire with a 4-1-1 record in the month with a 1.49 GAA and a .951 save percentage with three wins against nationally ranked opponents. He allowed two goals or less in five of those six starts. Foster registered at least 30 saves in four games for the Wildcats. He totaled a season-high 38 saves in the 1-1 tied with UMass on Oct. 24. Foster shutout Rensselaer, 1-0, on Oct. 27 at the Whittemore Center for his third career shutout with the ‘Cats. This award, named in honor of retired Boston College Head Coach Len Ceglarski, is given by the league to one player who has consistently demonstrated superior conduct and sportsmanship on the ice. The directors of Hockey East established the Len Ceglarski Sportsmanship Award in 1992. Each school nominates one player. The award is then voted upon by head coaches, sports information directors and league officials.